Auckland based company Shade7 are making their mark globally with their premium outdoor cantilever umbrellas. Specialising in outdoor umbrellas for both the residential and commercial markets, Shade7’s umbrellas offer high quality construction paired with stylish design. Focussed on delivering premium quality umbrellas suitable for a wide array of environments, Shade7’s umbrellas can be found in residential homes, cafes, resorts, hotels, yachts, commercial businesses and the like. Their most popular umbrella is the Riviera cantilever umbrella, which they designed and engineered themselves. Bearing New Zealanders in mind, the umbrella was designed to be strong, elegant, and able to withstand New Zealand’s harsh climate. Located in the coastal environment of the South Pacific, it was important for Shade7 to create an umbrella that would resist strong winds, harsh sunlight and salty ocean spray. The result was a strong marine grade umbrella which evidently makes the Riviera cantilever umbrella ideal for yachts too. 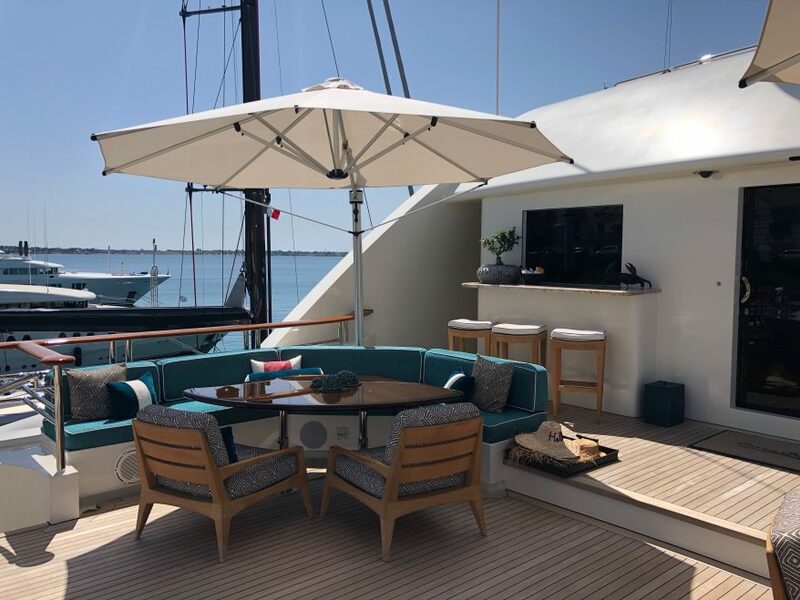 One of the most recent yachts to carry Shade7’s cantilever umbrella is the giant motor yacht Cocoa Bean, based in the Northern Hemisphere. Cocoa Bean is a private motor yacht used for personal use for majority of the year, however is now available for charter on a very limited basis. Constructed in the USA by Trinity Yachts, this huge luxury motor yacht boasts 74 metres in length and is said to be the largest yacht built by Trinity Yachts. The luxurious yacht sleeps 12 guests as well as 19 crew on board. Cocoa Bean is equipped with an elevator, multiple living and dining areas, gym, jacuzzi and a beach club fully equipped with water sports – just to name a few of its luxuries. This remarkably stunning yacht offers generous sized spaces throughout the vessel, adorned with an exceptional interior design and décor. 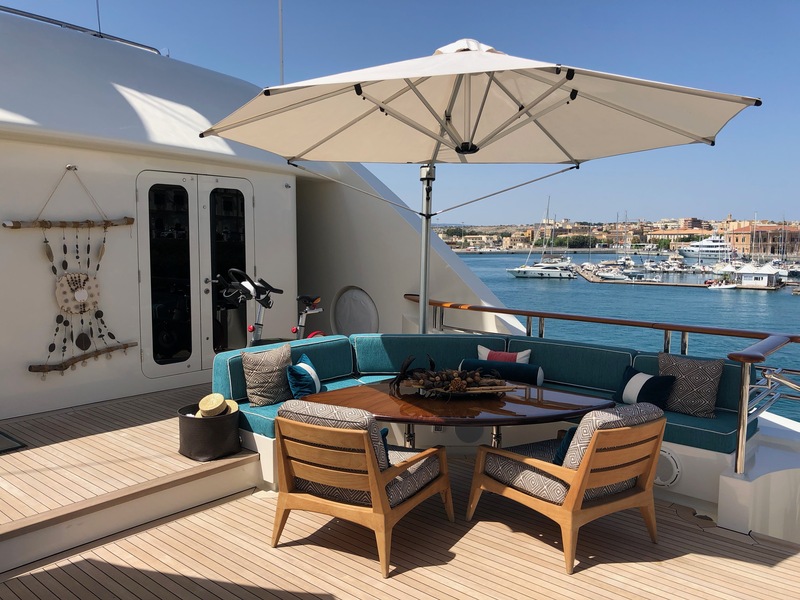 Shade7 were contacted to provide a replacement solution for the umbrellas located on one of the outdoor living spaces on the top deck of the yacht. The Riviera cantilever umbrella was the obvious solution, known for its strength and having already been manufactured to a marine standard. Naturally a yacht environment receives constant exposure of rain or sea spray, so it is crucial that all materials used in the construction of the umbrella will not rust. The Riviera’s mast and other umbrella components are made from marine grade anodised aluminium which will not corrode. Wind speed is another critical issue out at sea, which is where the Riviera performs well. These cantilever umbrellas are rated to withstand wind speeds up to 40kph, 50kph or 60kph depending on the size and shape of the model. For Cocoa Bean, the Rivieras were supplied with a canopy stabiliser kit, which are designed to increase the umbrella’s stability for commercial environments and exposed locations. Guests on board Cocoa Bean will also benefit from the premium marine-grade outdoor umbrella fabric used for the cantilever umbrella canopies. This high performing solution-dyed acrylic canvas has been manufactured by S.A. Recasens in Spain. It comes with a UPF80 sun rating, which restricts the maximum amount of harmful UV light, giving excellent sun protection. In addition, the umbrella canopy fabric has earned a 7-8 out of 8 colour fastness rating, proving its ability to resist fading. As the umbrella canopy will endure constant exposure to direct sunlight, the choice in fabric for the Riviera was paramount. Each and every component of the Riviera has been carefully selected and refined to produce a high quality umbrella that will hold strong in some of the toughest environments around the world. Cocoa Bean is just one of several yachts that are home to Shade7’s outdoor umbrellas. The Aviva superyacht, belonging to British billionaire Joe Lewis, is one of several other yachts that feature Riviera cantilever umbrellas. To discuss your own commercial or residential project, please contact Shade7.